This is the otto cycle engine which used Lothar ( the rotator ) instead of the piston. The side of the barrel cylinder ( the rotor housing ) becomes an eyebrow type. The one which is equivalent to the piston is called Lothar and is doing the triangle rice-ball type which is called the inclusion railway of 3 leaves which come in touch with a barrel cylinder in the inside. Lothar is installed in the axis ( eccentric sheave ) with which a core was shifted and turns freely. 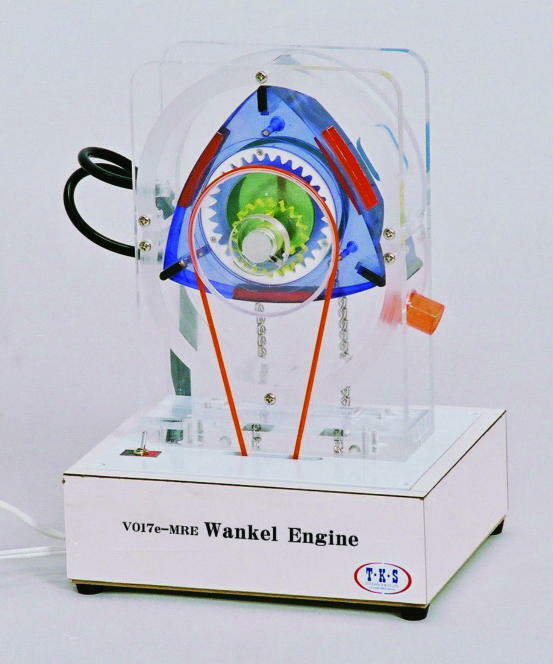 This cluttered engine compartment model can observe operation such as the function of Lothar inside, the operation of the eccentric shaft from 360 degrees, any angle because of the one where a distributor-body brake shield, front part is made from transparent acrylic fiber.
" Explosion " At the journey, the red-color LED lights up and lights up the inside of the cluttered engine compartment.